I love buying personalized items for my kids. There’s something special about the toys and clothes that have their names or pictures on them. Maybe it’s more sentimental for me, but I know that my oldest certainly also gets a kick out of seeing his name and face on his stuff, so I was glad to have the opportunity to turn him into a superhero courtesy of FlattenMe. I received a SuperKid Personalized T-Shirt for review from FlattenMe. As cute as this looked online, I have to say, it’s even cuter in person! 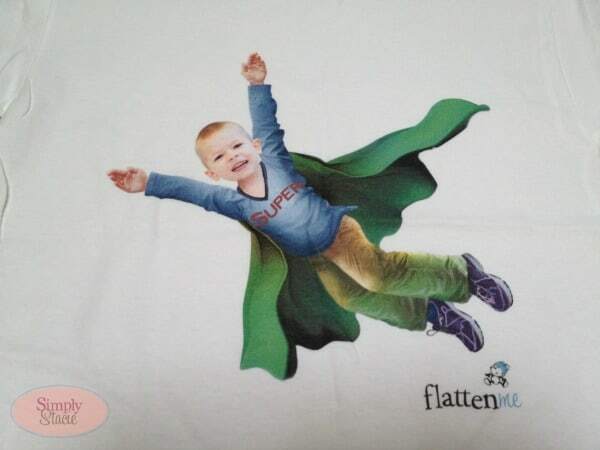 Ordering a SuperKid shirt is easy – simply choose your child’s gender, shirt size and upload a photo – flattenme does the rest! I used their guidelines and sent a photo of my oldest son where he was directly facing the camera. It was a high-res image that I knew would work well. His image on the shirt is sharp and clear, and it’s a seamless match with the SuperKid body image. I love the way it looks and so does my son. 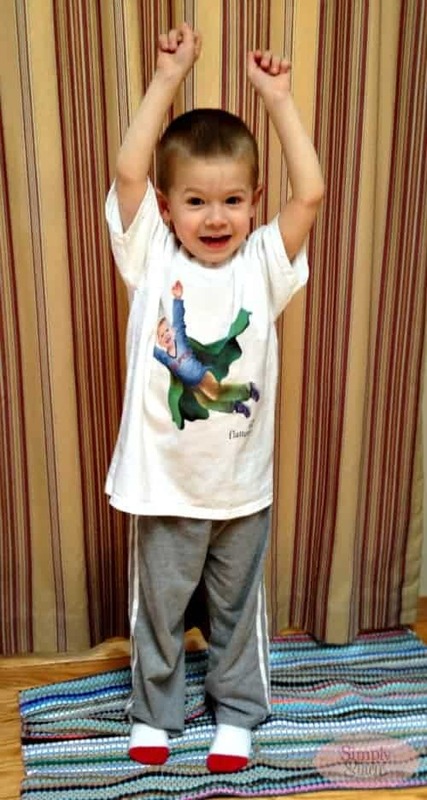 The shirt is tagless, so it’s great for younger children, and it’s 100% cotton so it’s breathable and comfortable. I washed it as recommended and found that there was minimal shrinking and the image held up great. I’m going to need to order a second one for my younger son, just because it’s so cute! I think this shirt would make a great gift for the superhero fan in your life. 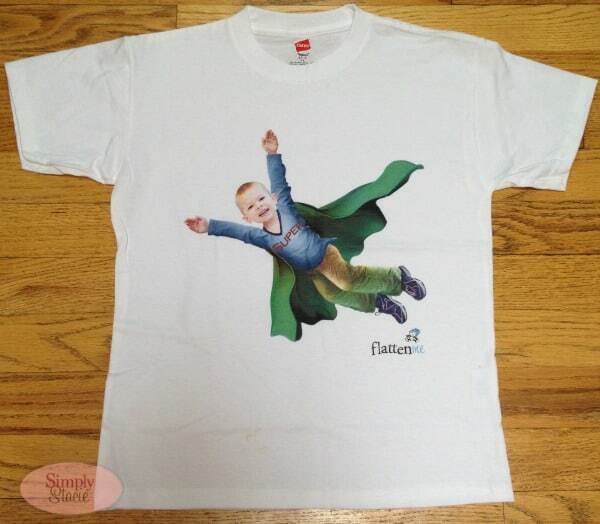 The SuperKid T-shirt sells for $27.95 on the FlattenMe site. Flattenme was started by Margo Redfern, who was inspired by her daughter’s love for a personalized book she and her husband made for her. The FlattenMe products are meant to spark the imagination of a child – to take a story which starts as a moment in time in a photograph and then becomes something entirely new. FlattenMe offers their customers the opportunity to personalize books, t-shirts, wall art, cards, and water bottles. To see the full line of products FlattenMe has to offer check out their website. You can also find them on Facebook, Pinterest, Twitter, and their blog. Through June 30th, all Simply Stacie readers can enjoy 10% off their orders using the code T_10 at checkout. I want to make t shirts for my hubby with my kids! You guys always find the coolest stuff!!! I would love to do something like this for my kids, my son would love it!! This is sooooo cute! What a great product! Thanks so much for the introduction! Ok, this has to be the coolest and most unique thing I’ve seen in a while! Thanks for the review! LOVE LOVE LOVE this! My grandson just got a baby brother and he needs a bit of attention himself, so this will be a perfect present for him. So thanks for the review, idea and code! These look adorable, and they have some wonderful designs. At first, I was worried you weren’t going to like yours and it came out looking corny but so glad that isn’t the case. Kids like personalized items, and this would be great for your superhero or princess. That’s great! My daughter would love a shirt like that! We always have to buy personalized stuff for her. Her name is technically a boys name, but I spell it different from the norm so it’s hard to find stuff like that. She would love to see what she would look like if she was a superhero! So cute! My sons are really into the superhero idea these days and they would love these. I had never heard of Flatten Me. Thanks for the tip!